Is My Child’s Bad Breath Normal or Cause for Concern? Bad breath does not discriminate on age. Both children and adult can develop bad breath, which is medically termed halitosis. However, when it comes to kids, it is often the parents who recognize it and become concerned. There’s nothing like snuggling your sweet toddler, only to immediately back away at the overpowering odor of their breath. How can such tiny people produce such foul breath odors? The truth is, children can develop bad breath for the same reasons that adults do. While most cases are temporary and harmless, if you are concerned that your child’s bad breath is more persistent or stronger than average, it is always best to talk to your dentist. Treating bad breath in kids could be as simple as brushing better or flossing more diligently. However, pediatric halitosis could also be a sign of infection or underlying health condition. Get checked out to be on the safe side! Food Choices. Your child’s foul breath is validated if they have recently eaten onions, garlic bread or other potent foods. Poor Dental Hygiene. If you’ve recently let your child start brushing and flossing independently, you may discover the lack of effort in their breath odor. 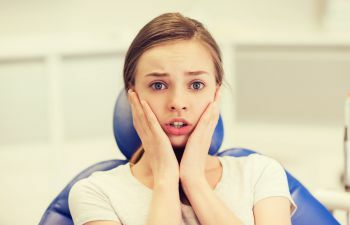 When bacteria is not properly cleaned from the teeth, gums and tongue, it can produce foul-smelling sulfur compounds that just aren’t pleasant to be around. Dry Mouth. When the oral environment is not moist enough and saliva production is decreased, it can lead to lingering bacteria and unstable pH in the mouth. It’s an effect that triggers bad breath. While keeping your child hydrated is important, it is advised that you check their medications, as many prescriptions and over-the-counter medicines cause dry mouth. In addition, if your child has a stuffy nose and becomes a mouth-breather, they are more likely to have dry mouth and bad breath. Infection. Is your child coughing, have a sore throat or postnasal drip? This can be a leading culprit to bad breath. Upper respiratory infections, tonsillitis, allergies and common colds need to be remedied in order to eliminate this type of halitosis. Oral fungal infections can also produce malodors. Cavities. While uncommon, if an area of tooth decay goes untreated for too long, it can cause bad breath – in kids as well as adults. Cavities need to be treated immediately to save the tooth as well as regain fresh breath. Stomach Issues. If your child is frequently plagued with intestinal problems, especially reflux, vomiting or burping, you can expect a bad odor in their mouth. Diabetes. A primary symptom of uncontrolled diabetes is ketoacidosis, which is a breath odor that is slightly fruity or produces an acetone odor. When it comes to bad breath in children, it is important to determine whether it is just a temporary nuisance or a long-term issue. If better hygiene doesn’t quickly resolve your child’s foul breath odor, make an appointment with a caring pediatric dental team. At Georgia Orthodontics & Children’s Dentistry, we treat a full gamut of dental health issues in children of all ages, from babies to teens!